Essential Oils are Effective but DO have Side Effects! Just because something is natural doesn’t mean it’s safe. 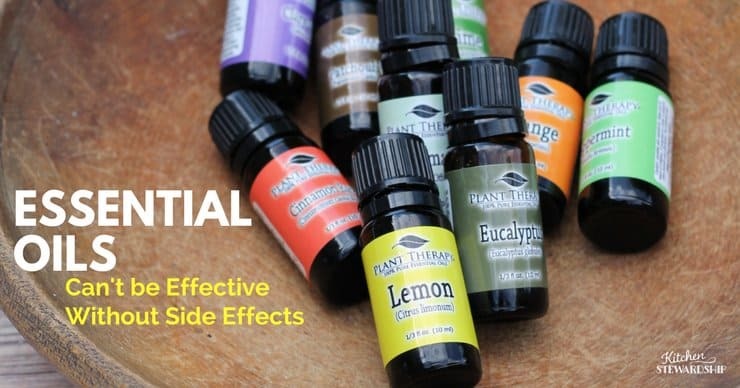 In the case of essential oils, there are going to be fewer side effects than man-made medications or phthalate-laden fragrances, but if oils are effective, then they have to make actual changes which means there could be negative or even dangerous effects as well. Knowledge is power (and safety)! For example, some essential oils are not safe for children, but some are gentle enough to be safe even for babies. Jumping in without any research or knowledge is foolish. I’m not going to pick on them, but it worries me. It’s just how I started. I’m definitely the type of person who is prone to jumping into something new with the bare minimum of information, just so that I can take one of my famous baby steps. I’ll buy an unfamiliar vegetable or cut of meat and then figure out how to use it. I’ll try a new recipe without thinking it through all the way, sometimes delaying dinner to a disastrous end. I over purchase at the Farmer’s Market and find the time to preserve what is already in my house after the fact. But if I’m in the market for something big like a computer, I always do my research first and painstakingly read reviews and weigh the options (or I make my husband do it). It’s too expensive to mess up. Really, I understand where the folks are coming from who are beginning to use essential oils and just want to jump in and try something out, but I want you to learn from my mistakes today. I regret my baby steps with essential oils. The truth to establish before we can have an educated discussion about the safety of essential oils is their efficacy. ARE essential oils effective – or not? Based on stories you can’t avoid from real people, online and often in person, you may have decided this for yourself already. And my own post on essential oils as better antibiotic choices than prescriptions also demonstrates power and efficacy. Essential oils are either powerful for helping our bodies OR they don’t do much – we can’t have it both ways. Logic tells us that if they really work, which people bothering to use them must believe, we can’t treat them like there are no limits. Either they work and should be respected, or they don’t. I strongly believe the former is true. But what do we need to know to use essential oils safely? Could Essential Oils Really be Dangerous to Your Family? There are plenty of things we use on a regular basis that could be harmful and require both responsibility and training: automobiles, weapons, even kitchen knives. They’re great to serve a purpose, but they can cause problems if used incorrectly. The people handling the item are not trained to use it. Some people, especially young drivers, simply don’t think they will get hurt – the rose-colored glasses and youthful feeling of invincibility prevent them from sensing real danger. Essential oils often trick well-meaning mamas in the same way. Plenty of people, even those sharing information about essential oils (raises hand), are untrained to handle them. Yet the Internet makes it very easy for us to talk about natural remedies and for others to listen. And just because it’s “all natural” doesn’t mean it can’t harm anyone, but we are easily lulled into a false sense of security by “natural remedies” just because of their name. There was a bit more lengthy analogy to a handgun at first, and boy, did I take heat! One reader on Facebook suggested that I was saying using any essential oil is like holding a gun to your head. Overreaction! I just wanted to make clear that we need to think critically about something so powerful. If a remedy is effective, then it must have the potential to cause side effects. Although my own family was not hurt (that I know of) by my use of essential oils without understanding all the precautions and risks, neither are most people who have unlocked guns in the house. I really wanted to emphasize that we need to treat essential oils as powerful, potentially dangerous things that can do great good but also great harm. Not everyone who uses one oil needs to be fully trained, but I do recommend that people dig into more than one blog post – including this one – before embarking on home doctoring. Even when used incorrectly, they won’t often kill or even harm anyone – but we need to understand that they could and stop treating essential oils like a bottle of dishsoap: squirt, lather, rinse, repeat. However – in that post which made such a splash and I hope was helpful to many, not scaring them away but teaching caution – even I didn’t have allllll my facts straight. I’m sharing the 3 reasons below (still valid!) but correcting any errors. I remember a scene in Person of Interest (I love Jim Caviezel, amen?) where the main character, a military-trained spy-turned-Robin-Hood chastises a group of young gangsters for holding their guns sideways in the classic gang “so cool” manner. He tells them condescendingly that they can’t possibly aim that way. In other words, learning from someone else who hasn’t been professionally trained can mean that you don’t learn the right way. Buying essential oils and jumping in with both feet before actually taking time to educate oneself about how they work and what precautions should be taken is a little reckless, much like driving a vehicle without a license. I learned to drive on country roads with my dad, before I took driver’s ed. What made that safe? (1) He knew what he was doing, and (2) we took it slowly. Just because someone says, “Use X essential oil to treat such-and-such a symptom,” doesn’t mean all the instructions are included or valid. It’s far too easy to just see a tip like “use lavender to help treat eczema” or “peppermint essential oil helps headaches” and not know how to proceed but feel a sense of safety because hey, “they’re natural.” Better to take it slowly…because, for example, peppermint isn’t recommended for pregnant women or children before a certain age, but that’s not always in every quick note about what you can use an essential oil for, you know? It’s also important to understand safe dilution for essential oils before slathering them on your body (or your children’s bodies). It’s not hard to do – but I feel it’s vital we take the time. Essential oils are the most potent substance of a plant that there is. Thousands of plants can go into one little bottle of essential oil, and different manufacturers can produce wildly different potencies, making recipes without knowledge of individual oils a bit of a gamble. Many well-meaning sources of information recommend too great a quantity in skincare recipes, use non-kid-friendly oils in family health resources without youth warnings, don’t detail diluted oils for topical use and can be brazen in describing regular internal usage without enough cautionary information. There are plenty of factoids one should know before using something as powerful as an essential oil. For example, did you know essential oils can’t be combined with homeopathics? I didn’t for quite a long time and used them at the same time as homeopathy for ear infections more than once. This was one of my more grievous errors in the original post. It’s a blanket statement that I heard from a friend but simply isn’t true – in its entirety. It has elements of truth though, and worth exploring. Topically, many essential oils must be mixed with carrier oils or they can burn the skin or have other deleterious effects. I didn’t know that either. Ahem. Plus essential oils do expire – and I always kind of thought they’d last forever! Internal Essential Oils? Use. Great. Caution. 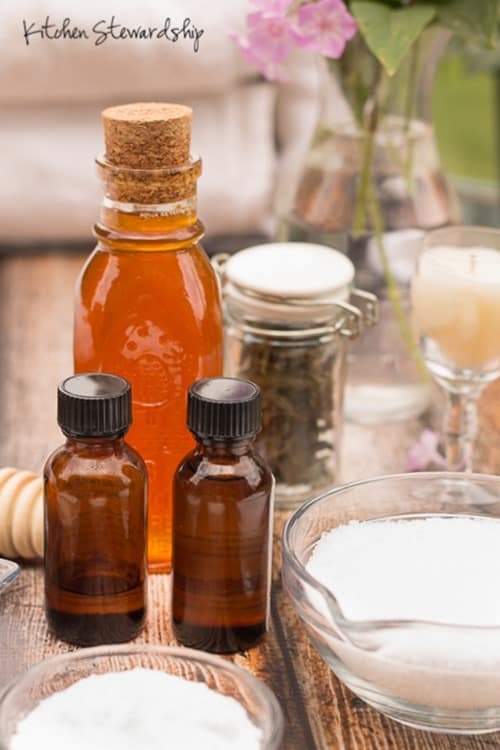 Whether humans can safely ingest essential oils at all is a topic embroiled in great controversy, but if you’re just dabbling, you might not even know that. Many oils are recommended for internal use without including cautions about frequency – even gentle oils like lemon shouldn’t be taken internally on a daily basis, and a great many should never be used internally. I was blindly following incomplete advice years ago and gave my son practically undiluted oregano oil by mouth. Guess what? It burns. Let’s just say that as much as learning together with your children is a worthy pursuit, this isn’t a topic to learn by experience. Just because something is natural doesn’t mean it can’t hurt you, especially if you are just using it without understanding all the potential repercussions. And guess what else? I’m not a doctor, naturopath, nurse, or anything else. So everything I’m spouting here? Could be wrong too. But I’m learning to err on the side of caution and “do more reading” than just recommending people to step forth in this arena. Do I think that one needs to be professionally trained to use essential oils at all? Certainly not. But they should do some research and know that there ARE risks so that they’re not running blind. 6 ways EOs can harm you – just to be informed, not to scare you! But you gotta know the risks. This article also lists negative reactions to EOs, but I really like the 5 quick tips to avoid adverse effects: wear gloves, wash hands, always dilute properly, rotate to avoid sensitization for long-term use, and buy from trusted sources. My personal favorite after years of use and trying many brands (there are lots of good ones!) is Plant Therapy, both because I appreciate that they have aromatherapists on staff (you can ask questions via customer service) and because they’re actually affordable. Plant Therapy‘s KidSafe blends were formulated by Robert Tisserand, agreed upon by many to be a foremost expert in our day on essential oil safety. Not a quick read, but my friend Katie pulls out more research and details than most, and her post on essential oil risks and safe ways to use them is a must. Our drugstores have children’s versions of everything from cough medicine to vitamins, but most people, myself included, don’t always understand at first that there are also “children’s versions” in the world of essential oils. Certain oils are not to be used on children under two years old, and others aren’t safe for kids under six. I have used oils on children in both age groups that I later found out were not recommended. You want to talk about mommy guilt, I’m right here. This post is one that I continue to go back to, if only to remind me to do my research well before trying something as potent as EOs. Who knew there were different kinds of eucalyptus and that some are great for kiddos while others are super harmful? Do you ever see people recommend a certain kind of eucalyptus for congestion? Nope. They just say “eucalyptus.” You have to do the digging to find out the rest of the story. I recently got some “Eucalyptus Dives” from Plant Therapy because it’s a KidSafe alternative for congestion. I looooove that PT does the legwork for me on child safety, and every bottle that IS safe for children over 2 has a KidSafe label right on it. This helps a lot when your child is coughing in the middle of the night and you’re reaching for that diffuser with groggy sleep in your eyes! Just like gun safety, I don’t want you to be left untrained with essential oils, unaware of the risks, or using the wrong ones on children. Here’s a post with some lists of EOs that ARE safe for kids, how to use them, and even some info on how to use EOs with babies (it’s a “hydrosol” which I had never even heard of before!). Still Want to Use Essential Oils? Learn to do it Safely! If you’re wondering, I do still use essential oils. I still recommend them to friends. If you’ve got a stash of bottles and no training, or if you keep hearing about the power of essential oils and want to “dabble” with them – don’t. You certainly don’t have to be a trained aromatherapist to use a few oils for home doctoring, but please make sure you’ve dug in a little bit and learned enough to know what you don’t know, to know to use caution and move slowly, just like driver’s training. Note: I’ve been asked a dozen times to sell essential oils. I’d love to, in one way. I would love to help arm mothers and fathers with tools to help them treat their families naturally. It’s empowering. But I don’t feel like I know enough to (a) commit to a brand and (b) teach proper use. So I’ve always declined the invitations, even though I know people make buku bucks doing it. Just sayin’. I’d love to hear from you – how did you get started with EOs? Do you feel training is important? Just because it is natural does not mean there won’t be an allergic reaction either. Tea tree oil is often suggested in eczema treatments and my little girl was allergic to it…even in a carrier. Thank you for your candid honesty in this post. Essential oil use as gotten out of control and people mostly don’t want to hear that they need to have at least a little training (from someone other than the person trying to sell them to you) before using to ensure safety. About 15 years ago I tried learning how to use essential oils from a book, and had no one around me to answer questions. Because I was confused about the difference between essential oils and carrier oils I just dropped the whole thing. I love the evidence based approach to essential oil use at Vintage Remedies! I’m sorry to report that I lost a few “friends” over the improper way they were using essential oils, and not wanting to hear that they could be doing harm. It’s going to take a lot more posts like this to get people to wake up! I lost a friend too. She posted on FB she drinks thieves in her coffee. What’s sad for me, is I was concerned for her safety. I posted some cautionary links and she had her rep respond back to me. She clearly hadn’t done any research on her own and didn’t know how to respond. Which is even worse because she is publicly promoting it based off of someone else’s advice. After going a couple rounds with her rep, she sent me another message saying I was out of line! I apologized for caring and left it at that. She isn’t. Not that I know of. She had been drinking it for a couple days before she posted the picture. She is a nurse and works around people with strep and flu. I just feel that there are better/safer options to support the immune system. I really appreciate this article. I read further down in the comments and saw that you lost a reader. Well, you gained me and I shared it to the oil group I’m in. Maybe you’ll gain a few more! Katie, I am assuming you are the author of this post overall, not just this comment in response. I want to take you to task on your presentation here because what you have done is intertwine two different issues and hopped on a form of sensationalistic quasi journalism to make your very worthwhile point. This should have been two articles: one on the potential dangers of essential oils and how to employ appropriate caution overall, and two on your own personal failing in this because of overzealousness or the charm of the thing etc. that you personally learned from- these are two separate issues, but by intertwining them in this way you have inadvertently introduced a subtle skepticism about something that could be beneficial for others who do not have your same personal shortcoming, while soft-pedaling your own personal failure with a type of under the table blame shifting. (I know this seems a harsh criticism as I type it out- but just to qualify my comment, you are not the Lone Ranger here- this goes on all the time online, and I have my own personal share of ‘been there done that’ Tshirts in my life closet over the same kind of thing. For the record, I am the Roman Catholic convert mother of 13 kids and wife of 30 years, veteran blogger and commenter since the internet was invented- I know some stuff. )What women need to know is exactly what you mentioned here- First of all in anything, get information, proceed with caution, remain the primary custodian in terms of personal responsibility regarding the health and welfare of your family under the sovereign power of God Almighty. If you need advice on that score seek it from someone you know and trust, not the virtual world. Secondly, know yourself, and don’t be surprised and shocked when you realize you might have been out of balance in somethings that were actually dangerous to yourself or your loved ones- happens all the time to all of us, that is why we recognize we depend upon grace and Truth to lead us, and to reveal our blind spots. But when you catch that part in yourself, dig deeper and find the root of your issue- it will really help you not repeat the same patterns and errors. If you need help with this, don’t let yourself off the hook,- really work your conscience, consider a silent retreat with Ignatius’ spiritual exercises, and again talk to someone you trust and know for spiritual direction in the real world- not virtually. This is sage advice from Crone Corner, borne of humiliating experience- not from some misplaced idea of ‘wow, can’t really understand why you got that wrong!’ accomplishment . Few women have it all together before the age of 75- that should encourage all of us. Thank you for your thorough and thoughtful reply. Nothing wrong with a little gentle Christian correction! I generally weave my story in with my thoughts and research; it’s just my blogging style I guess. I think a good story keeps people coming back, and I feel strongly about being real and genuine with my readers. I have a few years before I need to have it all together, thank goodness! 😉 I’m always learning, always sharing my personal journey. Hello, this is my first time over here. I, too, have been studying the proper use of EO’s after jumping in with a MLM without doing any research. Thankfully the Lord had me back up a bit and begin researching outside of MLM’s. Please be encouraged. I look forward to perusing your blog more thoroughly. I know this is late in the game, but I have to agree with Brenda. There was no hint of Christian love or spirit in the scathingly arrogant and condescending comment offered by Mrs. Flemings. Your incredibly kind yet honest response coupled with the information you provide via your blog will keep me coming back for more. Well…. Personally I liked rhebway she laid it out…. Had no.problems following her general train of thought or direction..
Also…. This would be *her* blog. Written in her own conversational style. If it made you uncomfortable, perhaps also you should go pray and see if the Lord isn’t trying to get YOUR attention…. It’s not anyone else’s job to not offend you. It’s your choice…. Just cause you *know some stuff* certainly doesn’t mean you know everything. And if, as you tyoedbit out, you KNEW your criticism was *harsh* maybe you.should have listened to that still, small voice remind you that it was harsh…. I Just cannot get over coming to someone’s blog–THEIR STORY OF THEIR LIFE AND EXPERIENCE And proceeding to tell them how to share THEIR OWN STORY. I found it refreshingly HONEST to have someone, anyone admit openly that people should not be DABBLING in these potentially dangerous substances…. If you peruse the Facebook link for Kitchen Stewardship you will see over 44,000 likes to the site. When a person sets herself up as a Roman Catholic reference for others in the public forum offering an opinion through which she fully hopes and intends to influence people for good for love of Christ she incurs a particular obligation by way of that stewardship and intent. Clearly Katie is influential and if you read the 184 comments here you will see a large number of people expressing the means in which that influence directly affected them with regard to this issue in the moment. I am 50 years old. I have 13 children. I have been a Christian for over 30 years, have lived in three different countries, and have travelled to over 10 different countries. I have a wide variety of of experience and knowledge and wisdom in the Lord as a woman and as a mother, and I have been reading information in women’s forums of this ilk since the internet started- since 1996 or thereabouts. The Bible says in Titus Chapter 2 that I as an older woman have a responsibility to bring to bear the insight I might have regarding this particular circumstance for the sake of the honor of the purpose for which Katie has opted to employ her energy in this ministry. That is why I bothered to take the time to make the public critique that I did. It was not just to bring the dynamic that I pointed out to her attention as a blogger in order to help her raise her own already well set standards, but to also call the readers to the accountability you have pointed out so fittingly as well. All too often those younger women among us who have less opportunity for interaction with well formed peers, or with well formed and more relaxed and wiser older women who can give them perspective and counsel, are at the mercy of the plethora of mob mentality running rampant on the web. It is difficult and time consuming and sometimes requires more interior discipline than many of them have at this point in their development- and that is not a criticism it is a norm- to wend their way through the fire hydrant blasts of information coming at them about how to fulfill their vocations. For this reason I have taken the time to state my case. It was an act of mercy, but of the type that very rarely feels merciful in the moment. I would not have felt so compelled to go into it here over this issue if it were not for the fact that if women, especially young women, do not begin to ground themselves far more firmly in their dominion and self possession in the Lord Jesus Christ amid the tossing trends of information that directly affects them flying around on the internet they will be victimized by it and the cause of Christ will be further compromised through them. To counter this, we can become an anchor of steadfast hope and faith if we learn to communicate in the public forum with greater care, humility, discretion, piety, and a firmer assurance of the sovereignty of God. Jo, I still have to agree with the comment just before your last one. You had no right to comment on someone else’s blog as harshly as you did. If you have questions for her, that’s one thing. But to “take to task”, as if this person was a recalcitrant child, instead of someone posting and her very own blog, is definitely not a Christian thing to do. I believe that you owe this blogger an apology. Whoa, pretty astonished on Flemings comment. Did anyone else drift in and out while reading Jo Flemings post, or have difficulties following what point she was wanting to come across? I do believe Mrs Flemming has, in her vast and varied education while traveling the world, neglected just a few things. Might I recommend a book written my Judith Martin, another by Emily Post, but first and foremost the BIBLE. Start with the book of Matthew Chapter 18:15 which says “If your brother (or sister) sins against you, go and tell him his fault, between you and him ALONE. If he listens to you, you have gained your brother.” Since Ms Flemming herself attempted to used the book of Titus to excuse her behavior, this gentle reader would like to lovingly suggest not skipping the FIRST Chapter which explains the qualifications an Elder must meet before being qualified to correct and teach. Please pay particular close attention to verse 16 which says “They profess to know God, but they deny him by their works. They are detestable, disobedient, unfit for any good work”. Our Lord Jesus says we are to Love the Lord our God with all our heart and all our soul and all our might and love our neighbors as ourselves. They were the only two commands he gave. Before taking a Christian sister to task publically because her personal writing style (or anything else about her for that matter) offends you, ask yourself why? Are you showing fruits of the spirit? Or could you possibly have a mote in your own eye while trying to remove the saw dust from hers? (by the way Jesus said to be careful of that too). Just for good measure we shall throw in 2 Corinthians 10:1, Galatians 5:22 and 23, 1 Thessalonians 2:7, and James 3:17. Mrs Kimball. Your gentle answer (Proverbs 15:1) obvious fruits of the Holy Spirit you display and your conversational and anecdotal writing style have won a fan for life. Count me number 44,001 ! Thank you for shining the Love of the Lord even when under attack. God bless. I know this is older, but it popped up on my pinterest and i followed it. I think the way it is layed out is perfect. Its relatable. Your journey is so much like so many others and it happened to so many exactly as you wrote it out. Im glad you didnt write it the way that arrogant woman thinks you should have. its great in your own style. That woman may “know some things” but apparently she missed the biggest one and should KNOW to mind her own business. I welcome all the information I can get.I don’t like taking medicine,and anything that I can use in oils,or homemade remedies,I’m happy with.I even use oils to clean with,my favorite is lemon,lemongrass,a squirt of dawn and water,smells so good.I’m still learning,experimenting.I m not brave enough yet to do the oils by mouth,I’m thinking about that one.Many a time I’d ask about making a roller bottle up how many drops essential oil to add,and I never get any response,I did finally get on one that directed me to a few links to get some answers and I found alot of info from there. Great info! To add- there are essential oils that are contraindicated for people with high blood pressure, people on blood thinning meds, people with diabetes, kids w/ ADHD, etc… It is SO important to research each oil before you use it, but find a reputable source. (Aromaticsinternational has great safety info following each oil’s description). The problem is that many people like me search and search for safety info and couldn’t find any info like I have since getting into some communities that promote essential oil safety. So I thought I had done a ton of research and didn’t find any safety concerns when in reality the concerns were being dismissed or covered by the people in the community I was in. When I started out the people and books that I trusted to give me safe recommendations didn’t and many people believe what they are doing is safe and can’t think otherwise for one reason or another. Also a drop of lemon oil is a lot more concentrated than putting lemon in your water. Why not just squeeze a real lemon in your water? Yes, I think lemon juice is a much better choice for your water; another reason is that it is water-based and will mix in, whereas oil is hard to distribute evenly in water. If fresh lemons aren’t something you want to deal with while feeling queasy, keep a bottle of lemon juice in the refrigerator door. Lemon oil is cold pressed from the rind or peel only, so it definitely is not as beneficial as the juice from a fresh lemon. All things on moderation is my feeling. At 43, I have been told to not drink lemon water anymore as it is leading to receding gums. The acid in lemon water can wreak havoc on the gums but it takes years to show up now I am paying the price. Urgh. I would suspect a drop of lemon oil to not be as acidic? Worth looking into. Lemon eo may not be as acidic, but it is also not as beneficial. Essential oils have zero nutritional value. That single drop of lemon eo you put in your water is strong enough to strip the varnish off of your kitchen table. What people dont realize, or tend to forget, is that essential oils are chemicals. Just because they are natural, does not mean they are not chemicals. One single drop of lemon eo is the equivelant of drinking the juice of 25 lemons. 25!!! That is a whole lot of Limonene coursing through your system and taxing your liver. If you would not squeeze 25 lemons into a glass and drink it straight, why use a drop of the eo? You want the real benefits of lemon? Use a fresh one. I loved your article. I just attended my first EO “class” from a MLM group and was excited to start our investigation into oils. We ordered a $300 kit and while waiting for it to arrive I started doing research on my own. OH MY STARS!!! I was shocked to read several articles that totally contradicted the things they were claiming were 100% safe in this class. They pretty much told you that their “therapeutic grade oils” couldn’t harm you at all. They encouraged taking them orally as well as “neat” with no carrier oils except for the spicy oils like peppermint. I don’t know why your gun analogy was so upsetting to people. For heaven’s sake…it was easy to see what you meant. Anyway, I appreciated your article and felt that it was one of the first “common sense” posts I’ve read in a long time. Some oils have caused coma and death in children as well as injury to eyes and other sensitive areas…the research and documentation is easy to find with a few minutes of googling, unfortunately, some people just don’t spend the time. Thanks for the honest and heartfelt post! I do enjoy following your blog/site and generally love what you write, but while your post means to be very helpful, it comes across differently. Essential oils are powerful – yes and can be harmful if used improperly (just like using a curling iron in the bathtub). You could read for years on Essential oils, but if you do not actually buy some and use them, you will not learn as much. As for comparing them to the use of a handgun, that seems like a cheap shot at our 2nd amendment rights, just to make a point. Another comparison might have been better. Literally millions of people are using essential oils, most likely much safer than prescription drugs which have been deemed safe by the powers that be, yet, hurt or kill huge numbers of people. I write this because your post seems a bit over the top to me a dedicated reader. I agree, this seems rather heavy-handed and a little bit more like a scare tactic than anything else. Perhaps that’s not how it was meant, but that is how it reads. I really feel like you went a bit far when you usedthe gun analogy. I think there’s room for good discussion without trying to make it dramatic. Well, you can kill yourself by drinking too much water, too. That’s a far cry from accidentally pulling the trigger on a loaded gun. Most everyday-use-type essential oils (meaning not weird things you’d have to go out of your way to find) are not remotely as easy to kill someone with as a loaded gun. There are probably plants growing in my yard that could kill my toddler when he plays outside more readily than 99.99% of the essential oils in my cupboard. So, yes, we definitely need to be aware of the dangers and exercise reasonable caution — which too many people do NOT do — but as far as their being a fatal risk, I’d put them more in the category of drowning in the bathtub. Everybody still bathes; we just know to use common sense and not do things like leave babies in the bathtub by themselves. You know what the most common household poisonings are from? Dish soap. So, yeah…your kid could drown in the bathtub or toilet. He could drink the dish soap or eat one of your houseplants or some toxic weed from your yard. He could fall out a window. He could get in a car accident. He could have a reaction to a prescribed drug or something OTC. All of which are deadly. But all of which are understood and accepted by the general population as risks that are just part of life, to be mitigated as much as reasonably possible, but then not dwelled upon. With a couple basics in place, the regular use of most essential oils falls into that same category. It does a disservice to people, IMO, to suggest that only schooled medical professionals can have adequate knowledge to treat the routine health needs of their families. Katie I appreciate your endeavor to educate and alert us to Stewardship- our homes and bodies. I don’t appreciate the gun analogy. it diminishes the concern for gun safety and heightens the concern for _potential_ deleterious effects of essential oils. However, I buy an oil for a purpose and I, too want to learn other uses for my oil. Don’t want the peppermint to go rancid because I haven’t used it. Beyond that, a bit of concern is warranted because Caution and Common Sense are highly encouraged in all endeavors when applying or injesting new substances. Thanks for all you do! No need to compare to guns. Acetaminophen (one example: Tylenol) is the leading cause of liver failure in the US (source: http://www.mayoclinic.org/diseases-conditions/liver-failure/basics/causes/CON-20030966) yet it is available OTC and is added to many cold and flu combination OTCs. I do use EOs & I also have a BS in Health Education. I research and read thoroughly & many of your comments are incorrect. ODing on Tylenol is certainly something people don’t think about, for sure. Modern medicine is probably MORE dangerous than traditional IMO, but that’s my my mistrust of the medical system. I don’t want to see traditional medicine get as confused as big med. Before you purchased essential oils, did you read up on them? safety? types of essential oils? potency? or did you just say, “hmm these bottles look interesting. I think I’ll buy them?” Very few people actually haphazardly go out and buy something, but they might if they are not given all of the information. I can honestly say I have had personal experience with someone who was following a recipe on a blog for a face cleanser. It had frankincense, cinnamon, clove, and a few others WITHOUT A CARRIER OIL. It burned the recipient’s skin. The recipe the person read online said nothing about carrier oils or potential dangers. I always use a carrier oil,because I had read where some oils were hot ,but I didn’t know what oils.I had gotten a bottle of oregano oil,I opened that bottle,and it took me awhile to eat spaghetti again,that smell was overpowering.I know peppermint is hot/cooling,but better with carrier oils,we use that alot for nausea,colds. I love KS, but agree with this comment 100%. I completely agree with Kristi!!! Thanks for your honest comment, Kristi – I definitely have nothing to say about gun safety or the Bill of rights. It remains the best analogy I can think of for something that could actually kill if used improperly that people ought to have training with. No training necessary for a curling iron, just a warning tag, you know? And I won’t recommend a certain brand as “best” at this point. I simply don’t know enough. I think a good number of brands are worth using. Forgot to add, that the quality of the various brands of Essential Oils on the market vary widely. Many are not pure, instead being adulterated with chemicals, other oils and fragrances. Find a company with real integrity, one that focuses or purity and quality – no compromises and also one that has been around for a long time. Quality is very important when it comes to essential oils but this isn’t really about that even though it is always stressed in certain companies and is important also. there are a few companies that have the pure quality oils (although most will tell you only theirs are the pure ones) some suggest safe uses and some do not or let their reps say whatever they want which is big part of the safety problem. Encouraging safe usage needs to be as much of an issue as stressing quality. After being a rep a short time I decided to use oils and get my info from a company who doesn’t have reps which makes me sad because I would rather be a rep and help friends with my purchases but the info in the arena I was in had become so tainted I can’t do that I was given so much incorrect info I now only trust those companies and people willing to accept and get the safety concerns out there. Without the safety info they may be helping people’s symptoms short term but no helping people in the long run. Find a company that will share their GC/MS reports with you, that’s the only way to tell what and how much is in each batch of oils made. Young Living Essential Oils Company….no, not “young living” as in trying to say you will be young, look young, feel young etc. The founder’s name is Gary Young. I agree with the overall thrust here, but I think it’s overstating things a bit to suggest that we have to know a ton before getting started. We have to know enough to know the limitations of our knowledge, but that’s sufficient. I don’t have to know everything about every essential oil to know I can safely use lavender oil on my toddler. So I don’t need to avoid using essential oils altogether until I’m thoroughly familiar with them all — I just need to stick with lavender until I learn about another one. Just like I don’t need to know everything about all the different types and manufacturers of guns to know basic safety rules and use one for target practice. Education is always key but your article disappointed me and the comparisons and points make me question your knowledge of essential oils. Offer solutions and information not just negativity and regrets. I have made some essential oil mistakes myself but none of them compare to the food and dr/drug ones and those results. I personally believe that the majority of people should be more scared of the food they consume then essential oils. Especially if they are using quality ones as Kristi commented above. Sorry I will no longer be one of your Facebook likes or followers. I can see having different points of views but if you have no knowledge as you stated then why even post the article. Why do they put eucalyptus in Baby Vics if f it’s unsafe? Are they trying to harm children? I don’t think there is eucalyptus in Baby Vick’s. Pine needle is what I use for my children in place of eucalyptus, as I have been recommended it is safe. I personally am not comfortable putting petroleum and turpentine on my children. I too, agree, with parts of this but not all. I think you are right to caution readers to not just start rubbing (or ingesting) oils all over themselves before they learn how to use them. But not using any of them until you know how to use them (all) would be missing out on some amazing benefits. I got started because one person who knew a few ways to use a few of oils suggested frankincense for a respiratory problem I was having that I could NOT get over. Literally the next day, it was better. A day later…gone. I was shocked. I would not have believed it if I hadn’t experienced it. And I was hooked and wanted to learn more. So I bought a basic kit. I still have no idea what to do with half of them so they sit until I can learn (or have a need that one of them will fill). But I Praise God for the frankincense, the peppermint, and the Thieves on a regular basis. I am prudent (no ingestion for us yet…I just don’t know enough about it)…mostly diffusing and some skin use. But when you see how fast peppermint and Thieves stop a cold in it’s tracks, you realize how amazing these oils are. We eat a traditional diet, so our basis is good. I don’t know what kind of effect it would have on someone who eats a SAD. And I don’t think using them is a way to eat crap but stay healthy…they aren’t the silver bullet of health everyone seems to want. They are another piece of the healthcare puzzle! I don’t feel in any way ready to teach people about them, but I will share the way we have successfully used them. And although I don’t expect to be a person who uses 20 different oils a day, I do suspect that they will be a part of my life forever. 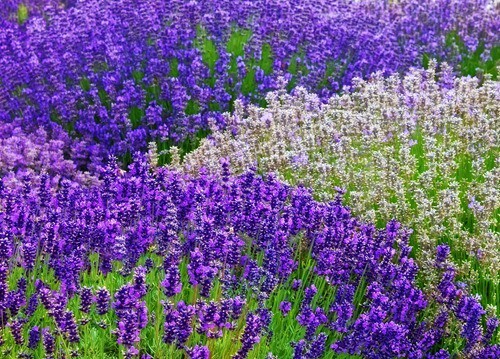 And when my 9 year old walks up and asks if I can run a little lavender on her scrape because it makes it feel better, or my son ask for some peppermint rubbed on his back or chest when he feels a little congested (both in coconut oil), you realize that even the kids can FEEL the benefit. Use caution and certainly don’t let the kids get into them by themselves, but don’t be so scared you pass up this amazing tool to better health. I love your story! Especially the part about your kids – I hope you like the edits I’ve made to the post. I definitely didn’t intend to turn people off from using them altogether. Broadly I agree with this essay and I think it is an important perspective that really needs to be available to balance out all of the promotional frenzy that I see on the web. I am a practicing family herbalist and I do see tremendous abuse of essential oils, especially those associated with multi-level marketing organizations. I am disturbed that individuals who sign up with some of these businesses and are essentially salespeople/distributors are given titles like “Wellness Advocate” or “Certified Consultant” without any training. Many are not only jumping in and learning as they go but actively promoting faulty and sometimes dangerous information for profit. I have personally helped individuals who sustained fairly serious burns using undiluted essential oils on their skin upon the recommendation of the “certified consultant”. This is a complex issue with many facets but these MLM businesses are damaging to responsible, well-educated, legitimate aromatherapists and mislead a public eager for tiny bottles and quick fixes. Essential oils are a potent and useful aspect of maintaining health when used appropriately. Ecologically, over-use is driving more plant species onto endangered lists. It takes HUGE amounts of plant material to produce even one ounce of essential oil. Using that oil up wantonly when a cup or pot of tea using a few tsp. of the plant would have addressed the health concern more effectively is poor stewardship. I agree that education is paramount and that education needs to be with a reliable, knowledgeable teacher. I was sort of sad to see the sales pitch at the end of the article and wondered if it wasn’t just another organization trying to get promoters signed up. I don’t know Vintage Remedies but I have seen a lot of promotional spiels on the internet for them. Still, I appreciate your opening the topic up addressing a very real issue. Good luck on your learning journey! I like the point about poor stewardship – that’s really true and insightful. Very informative and it touches on exactly why I have not personally made the leap. I’d love to take a course, hands on, in essential oils. My only problem with this article; do you have to qualify the word “gangsters” with the word “black?” Is it necessary? Aren’t gangsters just, gangsters? I guess I’ll be the contrarian here. I think the comparison was fine. I’m sure if we think on this all day we will find a better one. But, for those who are disappointed in this post, might not have seen what essential oils could do to a child, or a person who may be allergic to one. Seizures anyone? Many people don’t realize that when you put that one drop on your child, you might as well make them drink a big box of tea. It could be like 45 teabags, depending on the EO. It is not healthier than the prescription drugs from a dr. Only if it’s used properly. It can very well be just as dangerous as prescription drugs. Like a gun, it should be researched out first. Why buy an EO, if you have no idea why? Dabbling is fine if you know where to draw the line, and your familiar with the side effects. But, hopefully you aren’t dabbling on a child, or a person who has an allergy to ragweed. Or some other type problem. Just like herbs. Just because rosemary is an herb, found in most stores, doesn’t mean it is healthy for everyone. It could cause high blood pressure. Which is most likely not a problem, but could be for someone who is already having difficulties in regulating their blood pressure. I totally agree with this post, and will be sharing it with many others, just so I can hopefully spare a small child from going through what could be a horrible experience. I second Jill’s comments. It’s a fine comparison. The widespread belief is that all oils are perfectly safe to use any ol’ way a person wants, under any circumstance and that “their” brand is somehow exempt from the rules of safety. They say “such and such brand is 100% pure, so it’s safe”. Would you say the same thing about arsenic? Would you rather ingest 100% arsenic, or an adulterated version with perhaps only 10% arsenic? Might seem like a silly thought since so many think natural automatically equates to safe. Look up belladonna, then tell me it’s safe because it’s all natural. I think it takes a bold comparison to get peoples’ attention. So many are blinded by the fact that the MLM company says it’s OK to ingest because that means a person uses it faster and sales are higher. Does anyone recall that in the 20’s and 30’s smoking was touted as medicinal? How’d that turn out? Most damage that occurs from misuse of EO’s is subclinical, meaning that it will be 20 yyears before your liver shuts down from the long term exposure to too high a level of the constituents found in the oils that were so safe. I’m sure it wasn’t easy for Katie to admit that she had been using them without proper knowledge, but I’m glad she was willing to share that info. I’ve found the website learningaboutEOs.com to be very helpful in researching certain oils and blends. It includes alternative blends for the popular “thieves” blends which are not appropriate for young children (can cause reduced respiration and other issues), using the proper scientific names so you can make sure you’re using the proper oil. Even peppermint oil must be used with caution…it should always be very diluted, and shouldn’t be used by nursing mothers because it can reduce your milk supply. While I’m enjoying learning about my oils (I am just starting out with them), I have accepted that I always need to research the oil I’m considering using and how I’m going to use it. Seriously, this article just makes me mad and impatient, pretty much all at once. I do NOT appreciate the scare tactics here. effects of RoundUp, BT Toxin, 2,4 d, and other carcinogenic chemical pesticides routinely used on food crops int he US – I mean, OK, if you do not know how to use essential oils, please educate yourself before using them, but really? As if young people were endangering their children by essential oils compared to all the other hazards not disclosed in the modern evnivronment? no way. Sure, learn how to use essential oils, but no, do not get hysterical and pedantic about it. Nope. Not buying it. IMO, “other things are worse” isn’t a very good argument. Of course there are other things that are worse! Seems like everything I worry about, someone’s always around to tell me it could be worse. But there isn’t a law that we are only allowed to worry or take care about the top ten biggest issues. Yes, EO’s are safer than many drugs, but they do still have risks so you should know what you’re doing. Why is that such an offensive message? I think in this case “other things are worse” is not a good argument, instead it is an important point. And further I think that people should know about anything they put in or on their (or childrens) bodies. We just use shampoos, hair care, body care make up, lotions aimlessly sometimes and they contain horrible things. Be aware what ever you do. I’m disappointed with this post too. There is a huge difference between using a gun and eo’s. Are there really people that pick up an oil and use it on a child first without knowing anything else… Especially someone who has allergies/other health problems?? I use oils from a company that has been around a long time, has tons of resources for customers, STATES THE DILUTION RATIO ON EACH BOTTLE, has info on bottle if it has been approved for consumption, etc. Not all companies are equal. I think getting a bottle and using it is the best way to learn what they can do. I agree that you should read the bottle and know how to use it. And please talk to a doctor if you have high blood pressure or other concern before using oils. I think this would be better if you gave more help instead of just stating problems and turning people off from oils. I’m pretty clear about the fact that I’m not qualified to give advice on the EOs nor to recommend companies that do it right. I just don’t know enough. I do know that not all brands list dilution on all bottle sizes. And there are *definitely* folks who use EOs based on a brief recommendation from a friend or blogger without knowing any of the cautionary warnings I list here, which don’t even include things like reactions with prescriptions or certain health conditions. I’m glad you have found help in EOs, but not everyone does their research as well as you. You are obviously free to post whatever you want, and your own opinions are just that, your own. However, I just want to ask, what terrible things happened when you made an essential oil mistake? (I’m not saying that nothing bad could ever happen, but really this article left us hanging–other than some burning from the oregano oil, at least tell us what to look out for!) But as another reader commented, the consequences of some of our food, drug, or doctor choices can be far more devastating than minor “side effects” of using an EO incorrectly. You seemed horrified to find out that EO and homeopathy couldn’t be used together…well, what terrible thing happened when you did? (I’m guessing nothing more than a cancellation effect, in which case, no harm done, just not as effective as you were hoping). What are these risks you refer to? At least link to a source if you’re going to make such claims. I totally understand feeling frustrated or even duped when you realize you were given incomplete or even incorrect information regarding something you give your children. However, this article is over-the-top with an unfounded fear agenda. Yes, promote the EO class and resources, but for goodness sake, don’t use fear as the greatest motivator to do so. We have enough of that going around in America! I want to say I love your blog, I read it regularly and refer others here as well. I also know you are a real person with feelings and never would want to offend or harm you. I was just very surprised reading this post from you. Those of us who know that people should be very careful probably have had a personal bad experience or have researched extensively. Honestly while you don’t want to use scare tactics when you see people using natural medications like candy and have seen a reaction with your own eyes in your own 3 month child as I did and have many people deny that reaction even when it is documented that it can happen you become pretty passionate about safety. There are so many people who will deny that bad things can occur with essential oils but they would be wrong. To answer your question Possible reactions could be allergic skin reactions, seizures, medication interactions, decreased respirations, vomiting, abnormal movements, blood thinning with some, and yes like many things if you use too much death can occur. I used an oil on my 3 month old as recommended by people I knew and a book and she vomited, was lethargic, and had abnormal and I didn’t know what to watch for reactions because I was told how safe they were so I was looking for something else to be causing it but found out later when I used the oil again and found out more info it was that specific oil that shouldn’t be used on kids under 6 yrs old. Thanks for your sensitive comment. I’ve made a number of updates to the post since this morning as I respond to comments. You are right that we had no obvious ill effects from my mistakes (thank goodness). And definitely “feeling duped” is more accurate than “horrified” to find out that homeopathics and EOs don’t jive together. They probably did just cancel each other out (I really don’t know) but in the middle of the night with an ear infection, that’s not cool either. I thought this post was excellent! The gun analogy was also appropriate, however my opinion differs slightly. I’ve attended some basic gun safety classes, and shot numerous types of handguns. But I’m not an expert. I can tell you a little about the basics of caliber, revolver vs semi-automatic. But military guns? Long rifles? Shot guns? Nope. Not a thing. I’ve used EO for years, but still classify myself as a beginner. No one would eat 100 bulbs of garlic in one sitting, yet we don’t think about EO being like the garlic–very, very potent. Furthermore, if you need medical help for a condition that was caused by or exacerbated by EO, you are in trouble! Mainstream medicine, for the most part, is very ignorant of EO. I do not know how to use every EO out there. But I can use Lavender and Peppermint. I do quick research before using any of the others I have on hand. Thank you for writing this article on safety. I agree 100% after having a bad experience myself. I am a nurse, was an essential oil rep for a short time, and still love and use essential oils and hook people up with good info on them but there is so much bad info out there. The safety aspect needs to be understood and accepted by those in denial about it. Know that you are going to get a lot of flack about this article but please do your best to keep it up this is info people need to know. This is what I posted with a link to your article: After my experiences with getting into essential oils I totally agree with this. Essential oils are amazing and definitely worth researching and I still really like them and use them often topically in small amounts, in products, when sick, and by diffusing, but info can be hard to find and you can’t believe everything you hear right out of the gate because a lot of people who think they know what they are doing are just practicing what they have been told and following charts for use that anyone has put out. Essential oils work because every drop is strong and potent you don’t need to use much at a time for them to work appropriately. I have seen so much wrong info and reckless recommendations out there. Of course they will work quicker in higher doses but just because something works better in high doses or “doesn’t kill you” doesn’t mean it’s good for your body in those doses or that every oil is right for children at a certain age. This is natural medicine and needs to be treated that way. Always consult a medical professional (like a naturopath, holistic dr) who is well versed in essential oils on how to use oils appropriately before ingesting…don’t self prescribe or just trust what you read on the internet because there is a lot of bad info out there. You wouldn’t prescribe yourself and your children antibiotic pills or wing it and make your own. At the same time don’t let the fact that these are strong and therefore work scare you from using them. Most are safe when used diluted topically in correct dosages and better than chronically using synthetic medications. Many oils are even safe for children and during pregnancy when used appropriately. Sometimes too much of a good thing can be a bad thing but that doesn’t discredit that when used appropriately essential oils are a good thing that can be used for so much! Yes, it’s been a long afternoon of responding to comments! But thank you for sharing your thoughts. I’m curious to hear what your bad experience was if you’re willing. I loved what you wrote with the share – very succinct and accurate!! Are you DEAD because you Dabbled in oils – OH, NO? Well then the comparison of oils to Guns STINKS TO HIGH HEAVEN! Dabbling in oils may cause a minor skin irritation or a detox reaction that makes you feel fatigued or tired. It may even cause a skin rash, or you may have a sun reaction to a photosensitive oil, BUT PLEASE? A GUN??? Thoughtful article but certainly based on a scare tactic, I began by dabbling and have only brought benefits and health and wellness to my home. I think your comparison of handguns to essential oils is a little overkill. I think that while you made some valid points, you could have totally written this with a different tone – as in “I made these mistakes, let me help you to not make the same ones I did.” Essential oils and handguns are not even in the same atmosphere as far as I’m concerned, and I have both in my home. One mistake with a handgun could cost you your life. One mistake with an essential oil may cause a little discomfort for a bit. I use oils daily on my family, including my three year old. I have had to do a ton of research myself, and I think that’s the case with anything we bring into our homes. Like I said – I think you made some very valid point (straight oregano on your child’s tongue?? Did you not smell the stuff and realize how potent it was before it left the bottle?). People do need to educate themselves on the usage, but I think the chance of the oils actually “harming” someone to the point of death are not likely (Unless, of course, someone decides to ingest an entire bottle of Wintergreen because they have bad breath or something…) I would consider re-writing this article from a not-so-negative standpoint, and make it more helpful. It could actually be a very good read. I pretty much understand the point of this article and really don’t struggle personally with it, but I do have some questions about using oils and I haven’t had any real answers for. For example, I have found recipes that call for so many drops of oil (such as menthol in cough drops) but the warning on the label says not for internal use. Would it be wrong to use a small amount in a recipe for cough drops or something like that? (I have a recipe for something that called for lemon oil, but the lemon oil is not supposed to be taken internally). I’m kind of confused here. There are 2 essential oil companies that have their oils tested by third parties for pureness and the ability to use therapeutically. Some oil companies do not have as pure of an oil and must put the warning label on them about ingesting. The 2 safest oil companies I have researched are Young Living and Doterra. I have also read great things about Native American Nutritionals, they are quality conscious and work closely with the farmers. I have also used Ananda Apothecary successfully, but would not ingest their oils unless they were organic and the label did not prohibit it. Sadly many of the EO brands are not using pure oils or are using a cosmetic grade oil. I’m definitely not one to be able to give advice on that – you’ll find different people saying different answers about internal use of *any* oil. If your label says not for internal use, I’d listen to that over a recipe, personally. ? Bravo. There is far too much ‘Oh, it’s all natural so it’s safe’ around essential oils. I’m amazed people are talking about taking essential oils by mouth. That’s not what they’re for, and why would you want to, when you can get the benefit of them directly through the skin or inhalation? I went to a class last night. I did not buy anything. I use lavender, peppermint and tea tree oil for some stuff. EO’s are powerful. Putting something on your skin your in your body is huge. What amazed me most was many people are starting to use these oils, which over all I think educated use is great. But most people have not taken out the artificial crap in their diets, lotions, hair products etc. We need to be more careful with what goes in and on our bodies all around. This class was for infant and childcare. I think many of those people put Johnson’s and Johnson’s on their kids. I just don’t get it. Love this comment because this is what I have noticed too. “Yes, we are a healthy, natural family and use essential oils for our healthcare needs. Excuse me while I run out for my chic-fil-a sandwich.” Same with people that are all into their natural skincare while they eat crap for their diet. Kills me! I think this is an important topic and your analogy is okay, but I agree with Andrea that you spent too much time going over and over the idea that EOs can be dangerous, not enough explaining what those dangers are. A better analogy might be to medications. We don’t just pick up a bottle of, say, diphenhyrdramine, and wonder what we might do with it and start experimenting. We read about the appropriate dosage, reasons to use, side effects, and whether or not it’s safe for children, expectant mothers, etc. For medicines we get a lot of this info on the package or given to us by a pharmacist, so it’s convenient–but there may still be risks that aren’t publicized by the FDA, so it pays to do research. EOs don’t have a lot of standardized information, so the research is all the more important. Thanks for the honest comment. This is really meant to be an eye-opening post, not so much a teaching post…mostly because I don’t KNOW enough to do any valid teaching about essential oils. I appreciate this for a couple reasons. One, I like that you’re always on the side of what’s true, so far as you can tell. You don’t seem to have an over-developed sense of loyalty to anything that’s “natural.” I see a lot of this, and it’s just as frustrating as people who assume the FDA is totally infallible. Two, it actually allows me to consider using EOs. I’ve been intrigued, but I’ve never been able to reconcile the fact that most people seem to say, “Hey, these are amazingly effective at all sorts of things,” and in practically the same breath, “Just go ahead and dilute and rub on your kids, put in your soap, or diffuse in your house, because there are no side effects.” Side effects are like weeds – plants where we don’t want them. I never saw how anything could be both effective and benign. Somehow having someone acknowledge that there is more research to be done than reading a booklet helps me realize that I could in fact do that research and consider using them. I just thought I would chime in with a real-world example. An acquaintance of mine was taking essential oils internally, and ended up hospitalized. She damaged her vocal chords and could not speak above a whisper for several years. Her vocal chords are healing, though–last time I saw her she was actually audible. But that was an eye-opening experience for me, who is just starting out dabbling in essential oils. Yes, I’ve looked up on the internet how to use the small collection of oils I already have, but for example, I’ve used peppermint on the kids (neat, no less) following the vague instructions on numerous sites, and now here for the first time read that it is not safe for kids?! So, there you go. I cannot believe that you just likened using essential oils to having a gun in the house. I’m honestly just sitting here so saddened. There are so many good things that essential oils bring to the table. Do we need to use with caution and be educated? Yes. But, the way that you phrased this article is not attracting anyone to more natural remedies, it’s just scaring people. Also, I am all for evidence based uses for essential oils, but so many times experts and cautions are often misquoted. For instance, the caution against using eucalyptus for a child under the age of 10. If you had read through all of the evidence, facts and recommendations – I would think you would agree that recommendation is extreme and unwarranted. Of course, everyone has the right to make the decisions they feel is best for their family. I’m adding this for educational purposes. Hopefully this will help to clarify and further educate on the evidence behind using eucalyptus oil. It is almost 2 hours, so quite a time commitment. But I would encourage you to at least give it a listen if you are going to continue to educate others on the subject. I have actually already included a link to this podcast on your blog after a reader shared it on Facebook. I haven’t taken the time to look deeply into the Eucalyptus issue, but isn’t it a lot safer to refrain from using something that might be unsafe (especially when there are other alternatives still in the EO realm) than toss out recommendations that can’t possibly include all the information someone might need? Too many beginners, like myself, use oils without even understanding that there IS any risk at all. That’s my point. Critical thinking and doing research. I definitely don’t have all the answers myself. I added that podcast link after a reader shared it on Facebook – I was clear that I hadn’t listened to it, so hopefully folks don’t take that as an actual recommendation, just a note of another source. I read the post the podcast was in and it didn’t have any links to EOs so I didn’t even realize the gal was a rep, honestly. Thanks for another thoughtful post. While I agree that people shouldn’t go around randomly using essential oils with no education, there is a part of using oils that I believe is intuitive and maybe part of a trial and error scenario – let me explain…. Also, I have been drawn to certain oils (like lime for a few weeks….wanted it all the time!) and later I found out I had a condition that lime is often used to address. Also, not every oil remedy is effective for every person. Some people with migraines, for example, may be helped more by one of the oils than another for pain relief. 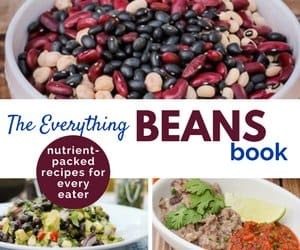 I would love to recommend a good guidebook in this post, but the one I have is from a certain company and I’d like to be careful to stay out of that controversy…what is yours? Thanks for taking all this time to read and reply to readers’ comments. I saw you made some edits to the article that may help make your points clear without ruffling everyone’s feathers about the gun issue. “Homeopathy is a placebo. It literally has none of the “active” ingredient left in it.” Just because you may not be aware of the studies which document that homeopathy works, does not mean it doesn’t. There is no *active ingredient* in acupuncture or reiki or medical qi gong either, and yet they work. Not everything works chemically, there are things which stimulate our own immune system to trigger healing. Not everything has to be drugged away. Over 100 million people worldwide use homeopathic medicine. Homeopath Joette Calabrese explains the error that some people believe about homeopathy being nothing more than a placebo very well. Animals, babies and young children are very successfully treated with homeopathic remedies and they cannot possibly be affected by the “placebo effect.” Homeopathic remedies have worked very well for me and my family. I also use essential oils at times, but prefer to be cautious, especially when it involves injesting them. I too have noticed many people using them in ways that could be harmful. Thanks for this article! So I’m curious, do you also suggest not dabbling with Herbal alternatives, such as TriLight Health, as I’ve seen you mention their benefits and recommend several times on your site? I appreciate this post because it highlights the fact that plant based medicine is potent, powerful, works, and should be taken seriously. 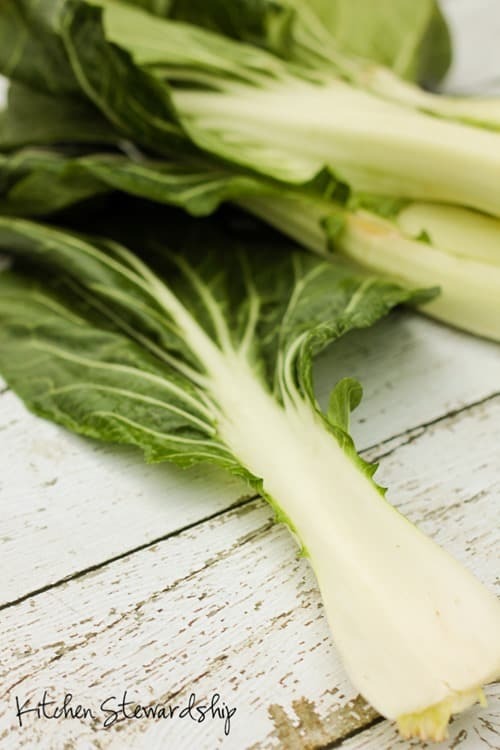 Many plants can be both beneficial and deadly, depending on how they are prepared, the dose, what they are combined with, where they are grown, etc. etc. and that includes EO’s. Thank you for pointing out the importance of training and knowledge. While natural means of attaining health are empowering because they are available to everyone, that doesn’t mean that anyone is qualified to use these methods effectively. Right on Katie. I have followed you for a while but never commented until now. I love this post because it’s so true and so many of my friends have gotten so wrapped up in supporting their essential oil companies that they seem to forget that these oils are powerful and can cause harm even if you have good intentions. The battle among people in supporting their chosen oil company and spouting marketing jargon that ultimately doesn’t seem to mean much leaves a bad taste in my mouth as well. I plan to take the Vintage Remedies course and I’ve been very slow in reading up and adopting minimal use of essential oils. I applaud you for addressing a controversial topic head on and hope that it will caution others to take their time learning and exploring essential oils. I hope you enjoy the course and feel much confidence from it! I really appreciate this post. I’ve been using some essential oils (mainly lavender and tea tree) for over 20 years. So, I’m not opposed to EO use. I am however, opposed to the EO bandwagon that people seem to be on right now. It’s interesting to me that although people use them “for health reasons” they don’t seem to think of them as medicine and as such should be used with caution. Just as I would not willy nilly give my family a pharmaceutical without researching it, I won’t give my family any medicinal herbs or EO without researching. Because the body treats them as medicine. I’ve taken this course from Vintage Remedies and I learned so much. I appreciate the thorough information given in the class. For the first time in 20 years I feel like I have a resource that I can confidently use. Thanks Angie! It’s great to hear from someone who has taken the course. I know others who are taking herbal courses from Vintage Remedies, and they say the same compliments. So impressive! I love hearing stories like yours and I’m SO happy that someone shared essential oils with you. I am sure that you did your research and the fact that you used them on yourself first speaks to the fact that you knew they could potentially cause harm. And that’s all I’m saying – Not “don’t use them,” because I still do, just “do your research” and know what you’re getting into. Your story is inspiring, and I’m so glad you’ve been a great example of natural health for the doctors!! So happy that they worked for you! 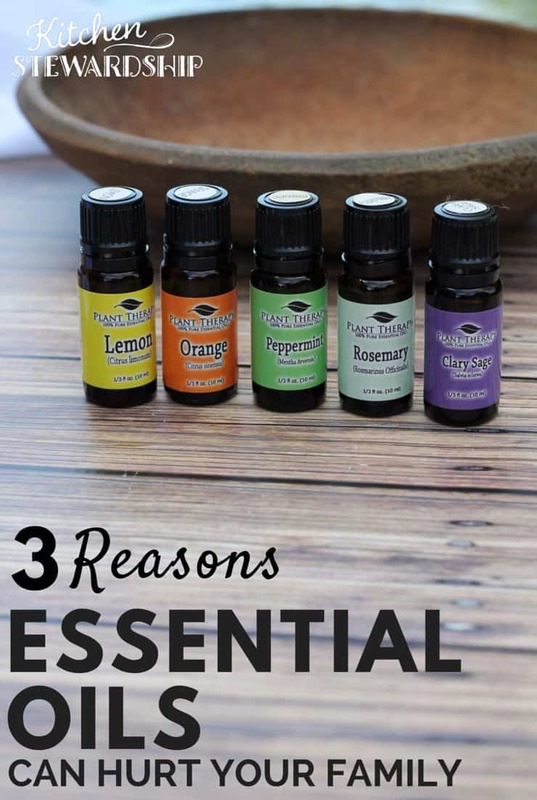 The question isn’t if essential oils work this post will make people realize that, just that people need to be cautious and know there are some safety concerns. I am thankful this was posted after my child experiencing a side effect after I was improperly educated. Have you no shame? I am totally agasp at what you will do and write to sell something??? No one in there right mind would give anything not prescribed by a Dr. To a child under 2. Lots of people own guns and are law abiding citizens and they have good sense! Unlike lawless people steeling a gun to use! Nothing about what you wrote made sense, I think it was all propaganda? I’m sorry you feel aghast today, but I assure you, plenty of people (some who have commented with their experiences on this very post) have used essential oils on children under two. I’ve added them to a vaporizer in room of under-two children as well. So you see, we don’t all live in the perfect world that you apparently find yourself in. Some of us need little reminders like this that essential oils are very powerful. Product mention at the end or not, this post holds important information that those less educated than you need to hear. I sincerely want you to earn a living, by selling products, but doing by scaring people is just wrong. Bloggers today are different than they were ayear ago, I’ve been spammed and scammed by bloggers I thought were trust worthy? For you to sell a product by scaring people is just wring! Your comment was personally offensive and hurtful, since you called me out of my mind – I used oils on kids under two myself. You accused me of writing this entire post as propoganda, just for profit, when in fact I truly do believe the information is important and was updating it for clarity all day yesterday. Someone writing just for profit wouldn’t bother to do that. I’m removing the bundle mentions right now since it’s over, but the post will remain as something very important for me to share with new EO users. If EOs feel scary after reading my post, good. People need to treat them with respect. How many times have natural health bloggers used scare tactics on many, MANY other subjects and then followed it up with a pitch for something they sell or profit from at the end. I’ve been out of the blogworld for a while, but that’s because I was seeing these shady tactics constantly. Katie’s blog is one of the few I still do read because she is balanced, responsible, and trustworthy. I find it astonishing and sad that so many people seem to be willing to write off Katie and KS now because of ONE post they disagree with or find offensive. Just goes to show how divisive and crazy-making EOs are. Honestly, I was more encouraged to learn about and use EOs from this post and others like Lea Harris who urge care and restraint than the rabid, angry followers I’ve seen lobbing cruel words at each other because one follows a company starting with Y and one starts a company starting with D. Seriously? If we’re all supposed to be carving out a safe space for natural living for our families against the enormous flow of society and commercial medicine, why are we tearing EACH OTHER down?? Brava and thank you, Katie. I also am in my right mind and used oils topically on my child under two based on my own research, a book on essential oils use with kids. and recommendations and what other people I knew were doing. It was so hard to find good true info. I was misled. If is what is being recommended in many essential oil circles which is the reason for this post I am sure. To raise awareness and keep kids safe. Do you know anyone in their right mind who has used name-brand disposable baby wipes? They contain dozens of chemicals, typically not listed on the label, which are absorbed through the skin and can cause severe reactions, yet many people use them on newborns without a thought. What are your thoughts on usin peppermint oil topically for migraines ? None, Ashley. I don’t want to give advice about essential oils. So sad to see all these bloggers trying to promote a sale. I am assuming that you would also say that one must be a certified teacher to homeschool? That we are not intelligent enough to care for our children or to care for our health. So very sad to use your platform to gain sales for this course. I don’t think anyone has ever been hurt or died from being taught by an uncertified teacher at home…and I am not saying that everyone who uses EOs must be certified. Not at all. I’m saying that those who use EOs, myself included, should take care to learn from someone who does know what they’re talking about…kind of like I would hope that a homeschooling mom had at least been schooled by someone who knew how to read, write and work figures before. I think this is important information and will be taking the bundle sale information out in a few hours when it closes, but the post still stands. I’ve been homeschooling for almost 20 years (and I’m not certified) and I did not get that from reading this post. Just as I’ve had to grow and learn (or relearn) things in order to be a successful homeschooling mom, I need to learn and grow in other areas also. My family’s health is one of those areas. I feel like Katie has helped her readers find a good source of reliable evidence based information in order to serve them better. I wonder if when you go into Target, if you get upset that they are promoting a sale? Something to think about. 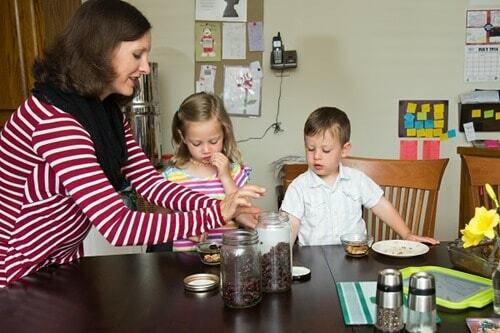 How does homeschooling compare to essential oil safety? Homeschooling, if done incorrectly, does not result in the same possible life-threatening ways as can happen with misuse and misunderstanding of essential oils can. Hey. Good article, but I’d like to address the issue of not being able to use homeopathy with essential oils. This is not necessarily true, as we have used them concurrently for many years. Each homeopathic remedy has specific inimicals and antidotes. Learning how to use these remedies includes understanding the properties of each remedy. There are excellent tables in the old homeopathic Materia Medicas that clearly outline these properties. Camphor antidotes many remedies (a blessing when you get the wrong one, but bad when what you really want is Belladonna…read “Little Women”) but that does not mean tea tree does the same even though it is ‘Cold’. Peppermint is often antidotal but not always. Just like essential oils, learning to use homeopathy requires a level of education. We should decide for the sake of our families, and those we share with, to actually study these arts rather than dabble in them. EOs aren’t any different than anything else in life. We need to take personal responsibility for what we choose. I think the gun analogy blew things way out if proportion. There is no need to scare people or assume they aren’t smart enough to learn on their own. I agree it’s info that people need. The tone was a bit harsh. I also forgot to add – Jim Caviezel…Amen, Sister! Hey Katie – I’d like to read the research you’re referencing below about EOs killing good bacteria…as you reference in the below paragraph. Could you link it up for me? I wish I could find it – this post is a veritable mish mash of what I’ve personally learned over the last 3-4 years, some through talking with people in real life, some through reading. I didn’t always mark my source – so sorry! 🙁 A few of the sources I have are from specific companies, and I’m trying not to link directly to them purposely. We take probiotics regularly anyway, so for our family, it’s not as big of a deal – but in some ways, common sense says that if a substance could be broadly anti-bacterial, how could it target specific “bad” bacteria without hitting the good ones? I had the opportunity to take a course through LearningHerbs in which a certified herbalist, Rosalee de la Forêt, RH (AHG), discussed the issue of someone who had been taking oregano EO for an extended period of time and how long it took for the person to get her gut back to normal due to that. There are so many great courses available for people who really want to learn about essential oils, herbalism, etc. It is vital to use these with knowledge. I joined a FB group to learn more about EO’s when I discovered the issue of eucalyptus in children is that, where in adults it helps stop the spasms that cause coughing and can give us relief, in children, it can actually cause them to stop breathing so they die. A little knowledge can be a dangerous thing. We have lost the wisdom of our grandparents and great-grandparents and are having to be trained as adults about things that are foreign to us. The balance of moderation, which items complement one another, how to use herbs and EOs to help our body’s own methods of fighting off disease without exacerbating the problem or introducing new problems is important. This is part of my goal for 2015 – to become a certified herbalist and really understand the herbs, their indications and contraindications of the herbs and spices we have available, as well as how to best use EOs for our family safely. Katie, I’m glad you wrote this article. It is important for people to know that EOs are potent and should be used with care. The nice thing is, there’s no harm to being careful. In fact having more info could help cautious people like me feel okay with trying EO’s. But no one is going to die or get sick because they read a book on EO’s before using them. I’ve commented several other places on here so far, but just wanted to say again how pleased I am with this post and how much I support KS exactly because of posts like this! I trust you because I’ve never seen you go off the deep end, I’ve never seen you be anything but polite even to those who hurl cruel invective at you, and I’ve always seen you use careful, well researched methods and seen you be willing to admit when you were wrong. As to EOs, people do need a huge wakeup call! I have heard people in real life tell me they’d rather not look at dissenting sources than their company of choice, or look at cautious advice, because they found it confusing or upsetting. I’ve seen oil reps posting promotional materials that state, literally, “Essential oils have NO side effects! !” Really?? I agree! Thank you Katie for raising awareness! If I had seen this post earlier I would have known to be careful. All anyone was telling me was that they were completely safe. I even had someone tell me you couldn’t overdose which I knew couldn’t be correct! Hi. I saw your post on the FB of a EO company that I am a rep for (disclaimer). While I think your handgun analogy was a bit off, I think your warnings are accurate. I can give several anecdotal examples of things I have seen on FB and other places where folks had 2nd degree burns from applying certain oils in excess in a “neat” fashion. I have used oils for about 15 years and we use some, especially tea tree, “neat” but largely dilute. I have seen where other friends took EO advice from bloggers and pinterest who have really caused themselves harm. With that said….I use my company’s oils externally and through diffusing (no internal use) as well as Aura Cacia (I have no affiliations with AC other than using them for about 15 years). It scares me that many oil users do not want to see words of caution such as yours. Keep on keeping on! What bothers me most about this post is the ending comment. “Since I don’t know much and am in no position to teach you about essential oils, I feel helpless that so many readers are hungry for the information.” If this is true, why are you writing a post about it? I am a nurse practitioner with a doctorate. I use essential oils and see MUCH better results with patients than most medications I prescribe. I HAVE read the research! The REAL research – not blog posts and Facebook. The real medical journal studies that are showing what essential oils can do. I can give you a bibliography of studies that show how powerful they are in treating infections (bacterial, viral and fungal), cancers an chronic conditions. Most of the studies are European because the U.S. has not performed many that have been published. These are randomized controlled trials (if you don’t know what that is, then find out – that is high level research). These show causation and impact of a treatment. Do you need accurate information on how to use them? YES! But that is true of every over the counter herb and medication that is out there. Yet people use these medications because they read it or heard that it worked. Scaring people away from using essential oils for whatever reason you are doing it and spouting off information that has not been researched is a real problem with blog posts such as this one. The World Health Organization states that over 90% of healthcare is done in the home – not by a health care provider. People need to find out what they are using, how to use it and consult an expert if needed. But honestly, a lot of this is just common sense. It doesn’t take much “research” to find out the safe way to use the basic essential oils. We must be our own health advocates. We must be educated with real information – not just blog posts on Facebook. Please if you are going to write posts – be able to back them up with some sort of real research. These kind of posts only further the misinformation out there – not only about essential oils but about nutrition, herbal and alternative remedies and others. Essential oils definitely work. I think if someone reads the post they will be able to see that. The problem is that a lot of safety information about essential oils is being hidden by big companies and a lot of people are being given wrong information like essential oils are completely safe or you can’t overdose. When I had safety concerns these are the things I was told so people are using the oils haphazardly instead of carefully like I am sure you would suggest people to use them. They definitely are wonderful thing and as a nurse who had a bad experience with essential oils getting started I am considering pursuing a career path in which I can help people with the proper use of essential oils also so I definitely appreciate the fact that you are doing your research and helping people with essential oils. They have helped us in many ways also but awareness does need to be raised since there is so much false information out there. I’m so glad to hear that there are randomized controlled trials on EOs. I know they are wonderful resources for better health, and I just want others to do exactly what you said – not rely simply on a blog post or Facebook note. My goal with this post is simply to encourage people to be aware, not to teach. But it’s an important awareness initiative as you’ll see if you scan some of the comments. First, thanks Katie, for a thought provoking article. Second, HOOO-WEEE! What is it about eo’s that get people all a-dither? I just left what could have been a great, informative EO group on fb for the sort of catty banter in the comment section here… Maybe it’s that gaggle of geese here flocking this article! I just want to love and serve my family as best and knowledgeably as I can, ever learning more as to how better to do that. So thanks for sharing Katie, and the rest of y’all (un-wad yer drawers &) take a deep inhale of some happy EO! LOL…I published this at night, went to bed and when I finally got back on I thought the same thing about the chaos (you should see the Facebook conversations, they’re just as crazy if not moreso)…HOOOO-WEEEE! I completely agree. Thank you for putting this warning out there! The post doesn’t come across at all as anti-EO or a scare tactic, to me. You just want people to think and to do their research. I’m guessing that people’s reactions are partly a feeling of wondering if they’re wrong, just like someone can be hostile when their conscience is wounded. There are so many unsafe recommendations out there and, having only changed recently myself, I’m so glad more and more ‘big’ bloggers are sharing more conservative information. Let me start off by saying I never knew how strongly people feel about their essential oils! Who knew? Katie, I enjoy your reading your blog and can’t say I always agree with everything you say which is completely ok (yea for ‘Murica!). What I took away from this article is that I think whenever we approach something new , it should be done with a healthy degree of caution and open-mindedness with a goal for education. That’s a vague, blanket statement but I’m sure everyone gets the point. I also get *very* frustrated when I see people taking an extreme view on issues especially when it comes to our health and well-being. “It’s natural so it’s all good!” “It’s man made so it’s all evil and bad!” Poison ivy is natural (whatever that means) but I’m not getting near that anytime soon. When my daughter was 2 and had a serious case of pneumonia I was more than happy to give her antibiotics and didn’t regret that decision for a nanosecond. Like anything else, we should do our homework before using essential oils. I think the gun analogy was a little on the dramatic side but hey, it’s your blog! I’m off my soapbox now to go diffuse some Thieves essential oil because my husband has a man cold and thinks he is dying. Happy New Year!